Caption slip reads: "Photographer: Mitchell. Date: 06-20. Reporter: Bontyette. Assignment: Serviceman's baby. for Monday. 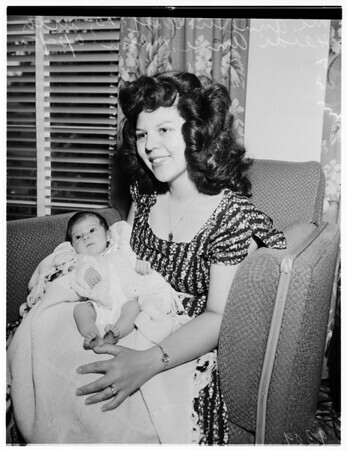 27/28: Mrs. Anne Lu Wolf, 20, with Heidi Anne, 11 days old, daughter of Sgt. Hans Robert Wolf of 160th Infantry, now in Korea".